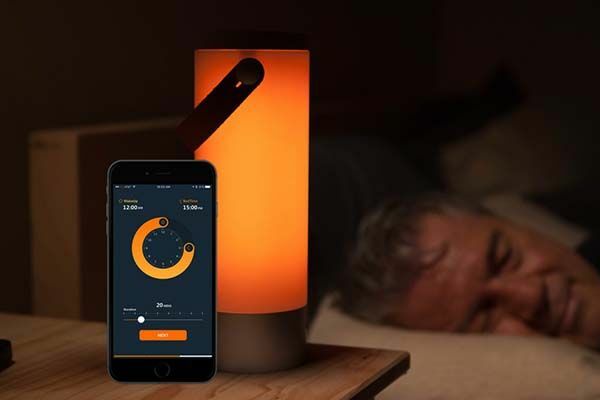 The UP smart lamp with built-in Bluetooth speaker is designed to improve your sleep/wake cycle by simulating natural light and delivering sweet music. Want to learn more about the smart light? Let’s continue checking. The UP is an innovative and advanced smart lamp that measures 80mm diameter by 233mm tall. As we can see from he images, the smart light shows off a minimalistic and elegant appearance design, and the portable cylindrical form factor allows you to place the lamp anywhere in your room. Meanwhile, a removable trap allows you to easily take your UP with you to the campsites or any outdoor places. The smart lamp features 16 million color lighting with 10 watt output, and built-in WiFi connectivity allows it to join in your local network, so you can easily use its companion app to set different color and brightness level to meet your mood. The smart lamp also works with Amazon Alexa, so you can control the light with your voice. More importantly, the smart lamp has the ability to simulate natural light plus built-in soothing music in order to help you reduce pressure from work and life and sleep with ease. When you fall asleep, the light will turn off automatically. By simulating sunrise process, the smart light also helps you wake up naturally, and you can also select a natural sound or your favorite music to wake you up along with the sunlight. 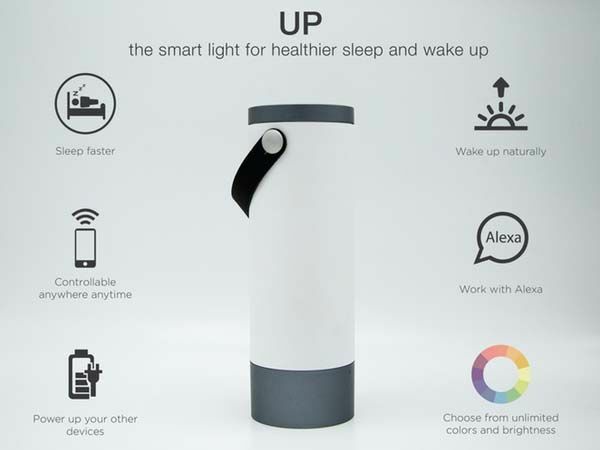 In addition, the UP also features a built-in Bluetooth speaker, and built-in 6000mAh rechargeable battery also serves as a power bank to charge your mobile device via a built-in USB port. The crowdfunding campaign for UP is ongoing via Kickstarter. You can pledge HK$535 (approx US$69) to preorder the smart lamp. If reaching its fund goal, it would be shipped in July 2017. BTW, don’t miss the Orb smart light and more cool related gadgets by following tags.